Erosion at Wasque was claiming nearly a foot of land a day two years ago. Erosion at Wasque Point has confounded the experts, forced the relocation of a large home and is the subject of ongoing study by coastal geologists. And now a West Tisbury resident has a plan he believes will reverse the rate of severe erosion at the easternmost tip of Chappaquiddick. 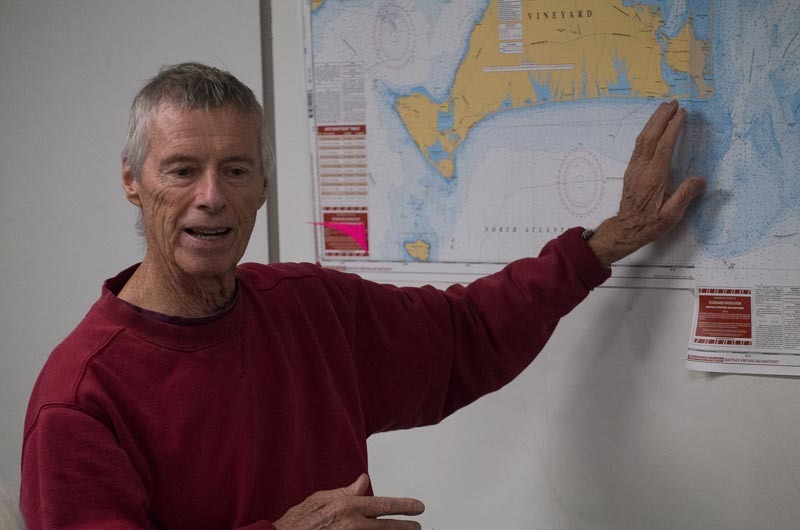 On Monday Kenneth (Mal) Jones presented his conceptual plan for sinking a barge off Wasque to a subcommittee of the Martha’s Vineyard Commission. 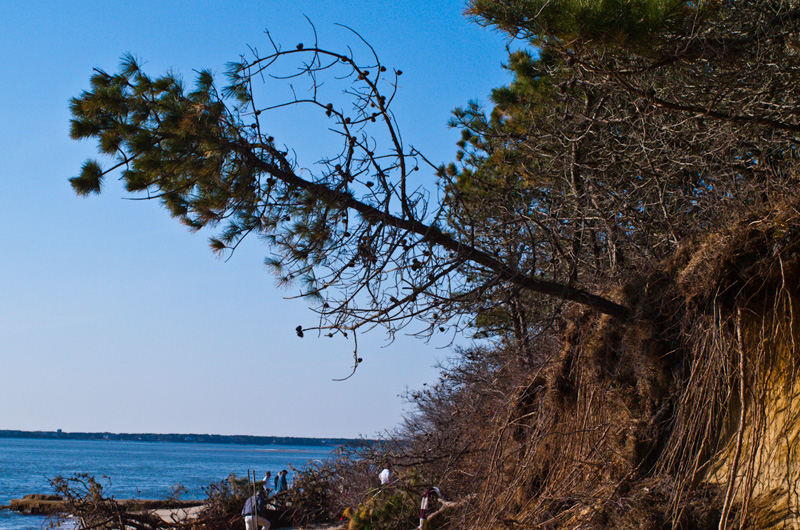 Erosion at Wasque accelerated after 2007, when a northeaster breached the barrier beach that once connected Chappaquiddick with Edgartown at the Katama end. The breach altered ocean currents, and by 2012 the shoreline was eroding at about .87 feet per day. The erosion caused dramatic changes at Wasque Reservation, a conservation property owned by The Trustees of Reservations, and led to the emergency relocation of the 8,300-square-foot home owned by Richard and Jennifer Schifter. Mr. Jones has proposed sinking a 190-foot barge south of Wasque, where ocean currents carry huge amounts of sand from the Island’s south shore eastward toward Nantucket. Over perhaps 50 years, he posits, the barge could block enough sand to greatly extend the shoreline. When filled with water, the barge would weigh 13,000 pounds, enabling it to remain stable “in the worst conditions expected,” according to Mr. Jones’s proposal. “After sand accumulates . . . water is pumped out of the vessel so that it rises and can be moved away from the shore to its next resting point,” the proposal states. The plan would be to slowly move the barge from Wasque Point to Skiff’s island, an uninhabited small island about a mile to the south. Mr. Jones estimated that between 1912 and 1996 an average of 25,000 cubic yards of sand were lost from the south shore every year. “That’s one big dump truck and one regular dump truck every hour for the last 84 years,” he said. He believed that rate has likely increased in the last 18 years. Conversation at the commission land use planning committee meeting Monday focused less on the details of the proposal than on how the MVC’s review might fit into the overall permitting process. “Should we be leading the way, here, or should we be waiting for other people to have a stab at it, and then we can be a little more efficient in the use of the commission,” said commissioner Joan Malkin. All ocean developments near the Vineyard qualify as developments of regional impact (DRIs) and may require review by the full commission. But commissioners said their role should come later in the process, once the many other agencies had weighed in. Those agencies would include the office of Coastal Zone Management, the Division of Marine Fisheries, the Department of Environmental Protection, the office of Energy and Environmental Affairs, the Army Corps of Engineers and town boards in Edgartown. Commissioners agreed that the various state agencies might be better equipped to evaluate the proposal. Review at the state level would be coordinated by the office of Energy and Environmental Affairs, in compliance with MEPA, the Massachusetts Environmental Policy Act. Commissioner John Breckenridge thought the Division of Marine Fisheries could present the biggest hurdle, since it was possible that depriving Muskeget Channel (between the Vineyard and Nantucket) of sand could affect local breeding grounds. But Mr. Jones said he had spoken with the DMF and their main concern was oil pollution from the barge. He said no oil or other substances would be stored on the barge when it is submerged. He said his interest in the project stemmed in part from his experience in the 1960s using large, movable blocks to alter the flow of water and reduce the size of sandbars at his family’s property on Deep Bottom Cove. As a side effect, he said, sand accumulated around the blocks, building up the land along the cove. MVC executive director Mark London said there was no specific time frame for the process. A public hearing has not been scheduled yet. Perhaps an idea whose time has come. As an Island visitor since a baby in 1937, Wasque very quickly became a most favorite place for me what with its beauty, solitude and expanse and anytyhing that could be done to stop the current erosion and even, perhaps, bring Wasque back would be more than most welcome. My wife concurs. Sounds like an intelligent proposal worth looking at. Additionally, pumping sand back onto the beach would be a big plus. Somewhere around 20+ years ago, Palm Beach FLA was facing a similar situation, except their infrastructure (roads, sewers, high rise buildings) were going to be lost to the ocean if 'nature took its course'. The Army corp of engineers pumped sand back up to the beach at that time (and probably did so again at a future date) The interesting point is that around that time there was a local coalition that was proposing some concrete structures off shore, underwater, that would disrupt the undercurrent. The concrete objects looked like the concrete dividers you see on highways off-island. I'm not sure if that succeeded or was ever installed, but is another concept, that in concert with the above proposal might be investigated further. Does mal have a barge he needs to get rid of?